Finding out that your aging parent is suffering from cancer is a terrifying and upsetting moment for you both as their family caregiver and as their adult child. By educating yourself as much as you can about the form of cancer that they have and what they might face, you can better prepare yourself to help them through this experience and to give them the care that they need. One important element of preparing to help your parent through a journey with thyroid cancer is understanding the stages of the disease. These stages are how the disease progresses and influence not just how the disease impacts your senior, but also the type of treatment and management that is available to them. Knowing which stage your parent is in at diagnosis can allow you to help them make treatment and care decisions that are right for them. T categories. 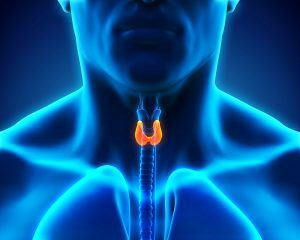 In thyroid cancer this refers to the presence or size of a tumor and whether it has made its way into surrounding areas. This can range from TX, which indicates that the primary tumor cannot be assessed or T0, which indicates that there is no indication of such a tumor, to T4b, which indicates that the disease is very advanced and the tumor has grown into the spine or nearby blood vessels. N categories. This refers to the extent to which the cancer has spread into the nearby lymph nodes. This can range from NX, which indicates that the regional lymph nodes cannot be assessed or N0, which indicates that the cancer has not spread to the lymph nodes, to N1b, which indicates that the cancer has spread to the cervical, retropharyngeal, or superior mediastinal lymph nodes. This refers to lymph nodes in the neck, behind the throat, and in the upper chest, respectively. M categories. This refers to whether the cancer has metastasized, and the extent to which this spread has occurred. It can range from MX, which indicates that doctors cannot assess distant metastasis or M0, which indicates that there is no such spread, to M1, which indicates that the cancer has spread to the bones, organs, or distant lymph nodes. Starting elderly care can be one of the best decisions that you can make in the course of your caregiver journey with your senior. An elderly home care services provider can be with your parent on a fully customized schedule to ensure that they are getting the care, support, and assistance services that are right for their individual needs. By evaluating their specific challenges and limitations and understanding their goals and preferences, this elderly care provider can give your parent a highly personalized set of services specifically designed to help them remain safe, healthy, comfortable, and happy, and to pursue the highest level of activity, engagement, independence, and fulfillment throughout their later years. As a family caregiver this can give you tremendous peace of mind knowing that both when you are able to be with your parent and when you are not, your senior is in the best hands.